On Wednesday, May 4 at 11:30 am, NA’AMAT USA, BROWARD COUNCIL invites its members and guests to celebrate the organization’s 90th anniversary at a gala luncheon at the Woodland’s Country Club, Tamarac. Bess Frumin, Council President, has announced that the program will star Myrna Goldberger, educator, performer, lecturer, and creative writer who will present her “One Woman Show”, “Pure Gold-The Life of Golda Meir”. 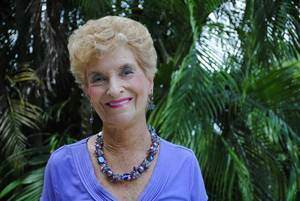 Goldberger calls what she does “Edutainment” as she has had over 50 years experience in education and educational entertainment. She uses storytelling, an acting technique in her lectures that have proven to be very popular, and is also known as the instructor who makes history come alive with a personal flair. A contribution of $125 per person to the NA’AMAT’s newest national project, a Woman’s Health Center in Sderot, Israel, will insure your reservation to the full course luncheon. Reservations are being received by Gloria Freling, 954-720-2893 and Isabel Resnick 954-437-8400. NA’AMAT USA chapters from Pembroke Pines to Deerfield Beach are part of the Broward Council. The Honorable Stacy Ritter, Broward county commissioner, will present the organization with a 90th Anniversary proclamation. In celebration of NA’AMAT USA’S 90th anniversary, we are proud to sponsor a new women’s health center in Sderot. The facility, serving the women of the town as well as surrounding kibbutzim, will be the first of its kind in the western Negev. Modeled on NA’AMAT’s outstanding health center in Karmiel, the Sderot facility will offer educational programs and workshops on health issues and concerns, counseling and promoting women’s empowerment. NA’AMAT is the largest women’s organization in Israel which works to improve the status of women and provides educational and social services for women, children, teenagers and families. With 300,000 members—Jewish, Arab and Druze women–and 30 branches, NA’AMAT Israel provides a huge social service network throughout all of Israel.